The stories of the Chambers Clan in this history reflects that of the Irish Diaspora, beginning with “Search for my Mayo Roots” by William Masterson, a third generation Irish American, whose life’s work was to unearth his Mayo ancestors and to provide much information, by the way, on the Chambers Clan. In these pages you will meet Patrick [Paddy] Joseph Chambers who emigrated to Australia around 1911. The tragedy of Thomas Chambers who fell at Gallipoli in world war one is signalled here in print.There are articles on farming practices, housing and education to be found here. Memories of 20th century childhood, who said it was all poverty and grief? Climbing up to lakes that shimmered in the sun, writing poems that reflect the hills around Newport, “As I rake the hay on a summer’s day” this was the lot of the country poet, who saw beauty in nature. There are over 100 pages of writing and pictures within these covers, and what great pictures they are,borrowed from family albums, treasures of times past, they tell their own story. Images such as that of Honor Rose Dolly Chambers peer out from times long past, her face serious yet compassionate. 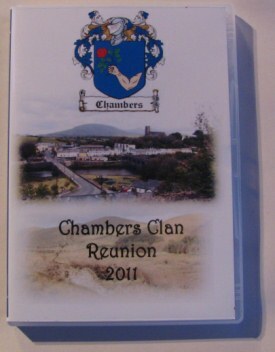 In these pages you will read names that are long associated with the Chambers name such as Frank, Liz,Paddy, Tom, Tommy, Michael, as well as Bridget and Nancy and Kate.There is a fine account of the places we associate with the Chamber’s name, the townlands they lived in, Cloonfoher, Drumlong, Letterkeen, Glenamong [with its various spellings] places where the family first took root. 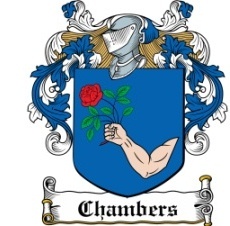 Remember, that even less than a hundred years ago , the Chambers who lived inthese parts were speaking Irish, were adding to the store and lore of Irish placenames that we still use today. Then there are the personal accounts, such as Margaret McNeela’s Glenlaura, and Philomena Bradywho writes with style of growing up in Derrycooldrim.If you want a Chambers Crest there is one here too, a fine article shows how the various forms of the crest evolved.To list every contribution is the job of the contents page, this short foreword can only hint at the quality of information that abounds within the covers. I urge you to acquire a copy and enjoy the read,enjoy the stories, and enjoy the pictures. 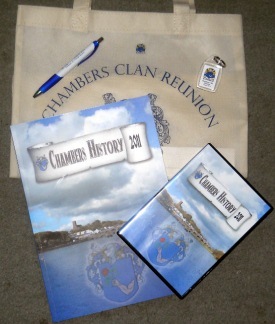 The Chambers Clan DVD contains over 700 pictures of families and their homesteads of Chambers families in the Newport area. All of the family pictures are accompanied by music and text.